The Pacific Community (SPC) is welcoming the conclusion of 33 years of negotiations between Vanuatu and Solomon Islands with the signing of a Maritime Boundary Agreement between the countries. A signing ceremony involving the Solomon Islands Prime Minister, the Hon Manasseh Sogavare, and the Prime Minister for Vanuatu, the Hon Charlot Salawai, is expected to take place in northern Vanuatu today. Vanuatu government officials said the landmark agreement will provide legal and jurisdictional certainty for Solomon Islands and Vanuatu for better management of the ocean, while at the same time allowing the two nations’ cultural and historical linkages to remain solid. In congratulating both governments, the Director of SPC’s Geoscience Division, Professor Michael Petterson, said it was also a special and rewarding occasion for SPC staff who had supported the complex negotiations over many years. “SPC’s Regional Maritime Boundaries Unit has been working with technical and legal teams from Pacific Island countries on the negotiations, alongside the Forum Fisheries Agency, Commonwealth Secretariat, the UN Environment Programme Grid Arendal and the Australian Government,” Prof Petterson said. “It’s been a privilege for SPC to help equip government staff with expertise and skills necessary for these maritime boundary negotiations since early 2000, and we’re all proud that capacity exists in the region to reach a successful conclusion such as this,” he said. In the Pacific Islands region, there are approximately 49 shared and overlapping Exclusive Economic Zones (EEZs), and almost 70 per cent of these have been successfully negotiated and signed by the respective leaders. The treaty between Vanuatu and Solomon Islands will be the 36th Maritime Boundary Agreement to be signed to date. 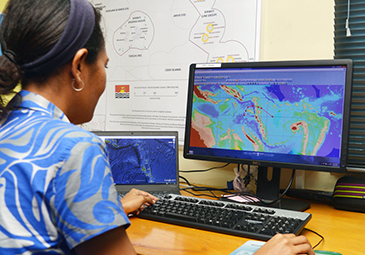 The successful conclusion of this latest maritime agreement also fulfils one of the regional ocean policies, namely the Pacific Oceanscape Framework’s key strategic priorities to formalise maritime boundaries and secure rights over ocean resources. Vanuatu officials this week acknowledged the assistance and technical support provided by SPC and other development partners over more than three decades.